In a large bowl, whisk together the flour, sugar, baking powder, baking soda, spices and salt. Rub the brown sugar between your palms into the bowl, breaking up any lumps, and then stir it in. Pour the wet ingredients over the dry, switch to a sturdy rubber spatula or wooden spoon and mix until blended-the batter will be very thick (really more like a dough than a batter) and not easily mixed, but persevere, it will soon come together. 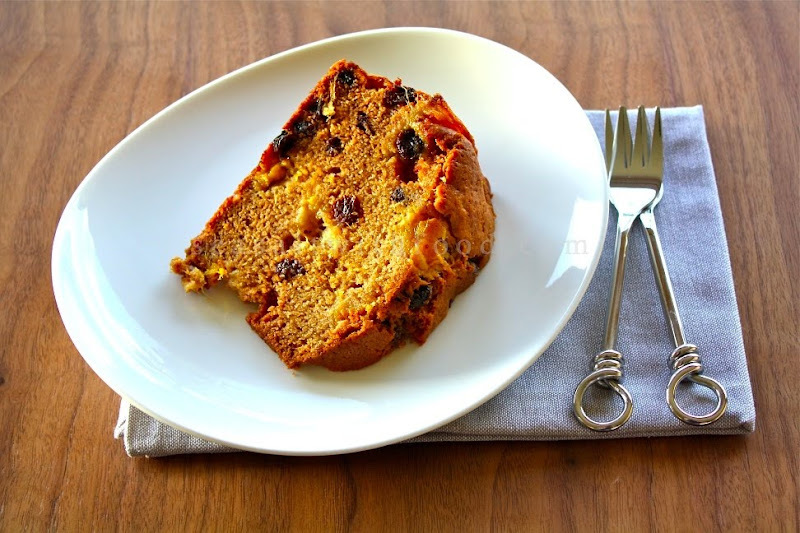 Stir in the mango, raisins and zest. Scrape the batter into the pan and smooth the top with a rubber spatula. Bake the bread for 1-½ hours, or until it is golden brown and a thin knife inserted into the center comes out clean. (If the bread looks as if it’s getting too brown as it bakes, cover it loosely with a foil tent.) Transfer the pan to a rack and cool for 5 minutes before running a knife around the sides of the pan and unmolding. Invert and cool to room temperature right side up on the rack. 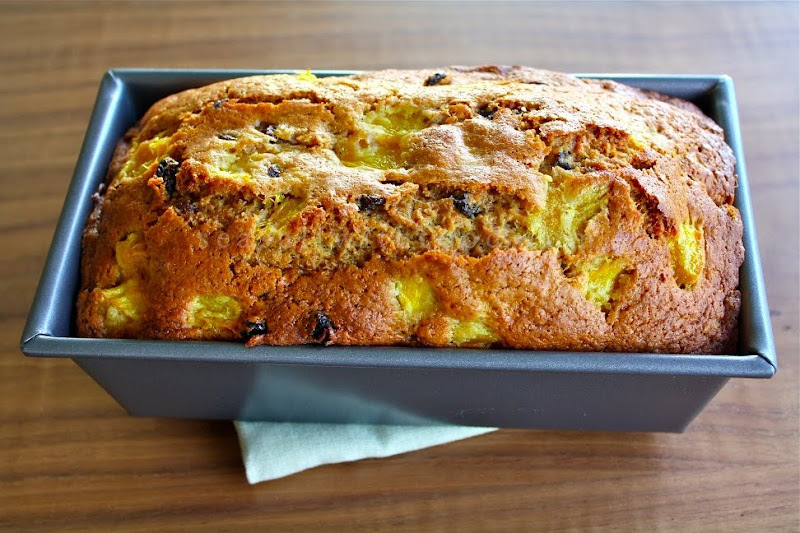 Angie, this is a mouthwatering bread!We are going to enter the mango season soon and I will look forward to trying this. I am sure that the bread tastes wonderful if I can find really good mango. Finding good tasting mango in the Pacific Northwest is like finding a needle in the haystack. I really like your site, and some of your recipes are really great. 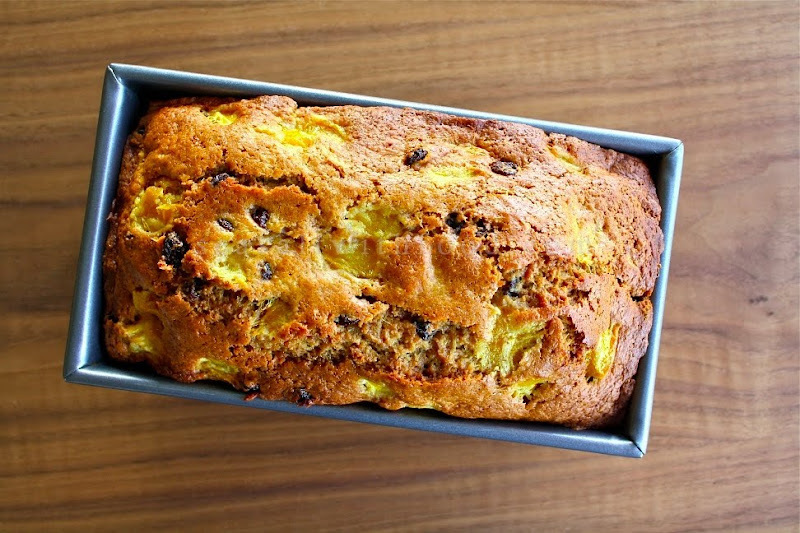 Thank-you for your contributions, and i will have to try this Mango Bread. I only recently discovered how great mangoes are, so I'm trying to find all sorts of different uses for them and I'm adding this to the list! the recipe calls for baking about 1 hr 30mins is it?